Abstract: AMD's most successful processor, the K7 (Athlon\AthlonXP) has come a long way in the last four years. AMD's most successful processor, the K7 (Athlon\AthlonXP) has come a long way in the last four years. We've seen it move from a 0.25 micron process to the current 0.13 micron, and from Slot A to the more reliable Socket A (462) of current times. Along the way this... dare I say... loveable processor has come to incorporate such things as Intel's SSE technology and seen a shift in L2 cache on die and upgraded to 512KB. For most consumers however, it is the price point of the AthlonXP processors that makes them so attractive. Significantly less expensive than Intel's top of the line counterparts, and with just about the same raw performance across the board, the only downside has been higher thermals and noisy cooling solutions. There are ways around the down sides, and if you are crafty enough to choose the right aftermaket cooler, a well vented case, and go easy on the case fans, you can have a pretty damn powerful computer with noise levels approaching that of the traditionally quiet Pentium 4. Today we're going to be looking at one of the last AthlonXP processors to come to market; the AMD AthlonXP 3200+. 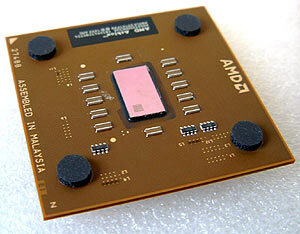 While the processor is still based on the Barton core, AMD raised the operating FSB from 166 MHz to a full 200 MHz. Other then running on a faster FSB, architecturally there is no difference between the AthlonXP 3000+ or the AthlonXP 3200+. The AthonXP 3200+ is using a newer AQXCA core stepping and this particular processor was built sometime in week 16 of 2003 and still runs on the same 1.65V core voltage. As with the launch of the AthlonXP 3000+, the AthlonXP 3200+ is available immediately. You may have also noticed that AMD are no longer price matching with their Intel counterparts. While this is good news for consumers, this is not good for AMD and will not stem the flow of red ink. If you're a loyal AMD user, do them a favor and buy the higher priced processors, the company needs good sales if they are to survive. While the layout of the processor may look a bit different, it's purely cosmetic as far as we are concerned.